USES: This medication is used to prevent cavities. It makes teeth stronger and more resistant to decay caused by acid and bacteria. This medication is not recommended for use in infants less than 6 months of age. 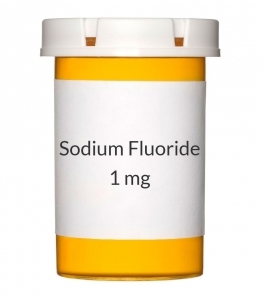 This medication is not recommended for use in areas where the fluoride content in the water supply is greater than 0.6 parts per million. See Notes section for more information. HOW TO USE: Take this medication by mouth, usually once daily as directed by your doctor/dentist. The dosage is based on your age and the fluoride content in your water supply. If you are using the liquid form of this medication, measure the dose carefully using the specially marked medicine dropper that is provided. Drops may be swallowed directly, added to a small amount of juice, or mixed with a small amount of food such as applesauce. Do not mix with food containing milk or other dairy products. If you are using the chewable form of this medication, chew or dissolve it in the mouth before swallowing so that the teeth will also absorb the fluoride. If you are using the lozenge, place the lozenge in your mouth and allow it to dissolve. Take the chewable medication or lozenge at bedtime after brushing your teeth or as directed by your doctor/dentist. For best results, do not rinse your mouth, eat, or drink for 30 minutes after taking these forms of the medication. Take this medication 1 hour apart from products that contain calcium, aluminum, or magnesium. Some examples include dairy products (such as milk, yogurt), antacids, laxatives, and vitamins/minerals. These products can bind with fluoride, preventing its full absorption. Use this medication regularly in order to get the most benefit from it. To help you remember, take it at the same time each day. SIDE EFFECTS: Stomach upset may occur. If this effect persists or worsens, contact your doctor/dentist or pharmacist promptly. Tell your doctor/dentist immediately if your teeth become stained or pitted. This is often a result of too much fluoride. Remember that your doctor/dentist has prescribed this medicine because he or she has judged that the benefit to you is greater than the risk of side effects. Many people using this medication do not have serious side effects. A very serious allergic reaction to this drug is unlikely, but seek immediate medical attention if it occurs. Symptoms of a serious allergic reaction may include: rash, itching/swelling (especially of the face/tongue/throat), severe dizziness, trouble breathing. This is not a complete list of possible side effects. If you notice other effects not listed above, contact your doctor/dentist or pharmacist. In the US - Call your doctor for medical advice about side effects. You may report side effects to FDA at 1-800-FDA-1088. In Canada - Call your doctor for medical advice about side effects. You may report side effects to Health Canada at 1-866-234-2345. PRECAUTIONS: Before taking this medication, tell your doctor/dentist or pharmacist if you are allergic to it; or if you have any other allergies. This product may contain inactive ingredients, which can cause allergic reactions or other problems. Talk to your pharmacist for more details. Before using this medication, tell your doctor/dentist or pharmacist your medical history, especially of: mouth problems (e.g., sores, mucositis). Tell your doctor if you are pregnant before using this medication. This medication passes into breast milk. While there have been no reports of harm to nursing infants, consult your doctor before breast-feeding. DRUG INTERACTIONS: See also How to Use section. Your healthcare professionals (e.g., doctor or pharmacist) may already be aware of any possible drug interactions and may be monitoring you for them. Do not start, stop, or change the dosage of any medicine before checking with them first. Before using this medication, tell your doctor/dentist or pharmacist of all prescription and nonprescription/herbal products you may use. Keep a list of all your medications with you, and share the list with your doctor and pharmacist. OVERDOSE: If overdose is suspected, contact your local poison control center or emergency room immediately. US residents can call the US national poison hotline at 1-800-222-1222. Canadian residents should call their local poison control center directly. Symptoms of overdose may include: burning in the mouth, sore tongue, nausea, vomiting, diarrhea, increased saliva, stomach pain/cramping, muscle weakness, shaking, seizures. NOTES: Do not share this medication with others. Taking this medication does not replace good dental habits. Continue to brush and floss your teeth regularly as directed by your dentist, and have regular dental checkups. Check the fluoride content of your water supply by asking local town or city officials. Fluoride supplements are not necessary if the fluoride content in the water supply is greater than 0.6 parts per million. If your water supply changes or if you move, check with your doctor or dentist to determine if extra fluoride is still necessary. STORAGE: Store at room temperature between 68-77 degrees F (20-25 degrees C) away from heat and moisture. Store the liquid form in the original plastic container. Do not store in the bathroom. Keep all medicines away from children and pets. Do not flush medications down the toilet or pour them into a drain unless instructed to do so. Properly discard this product when it is expired or no longer needed. Consult your pharmacist or local waste disposal company for more details about how to safely discard your product.